Once you’ve found the perfect gift, Valentine’s Day isn’t necessarily a slam dunk — especially if you’re presenting that lovely scarf in a department store bag. 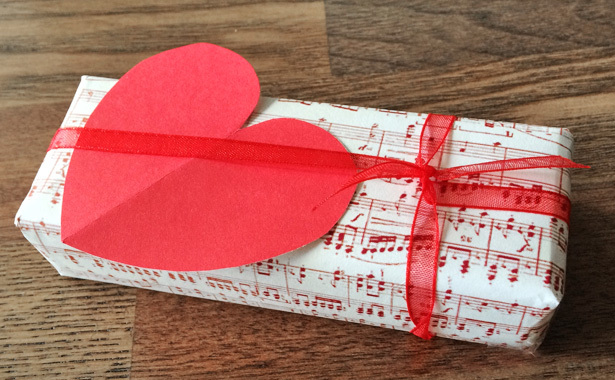 On the other hand, if you’re worried those hard-to-get concert tickets may not make his heart leap at first sight on their own, some creative gift wrapping can make all the difference. Corny in a good way, of course … These ideas are also quick and in most cases, don’t cost a cent. It’s all about wordplay. Wrap truffles in a map with a tag that says “you mean the world to me.” Tie a key to a ribbon and tell them they have the “key to your heart.” Add a button if your amour’s as cute as one. Glue a queen of hearts to the box for the queen of your heart (or a king for your king). If you’re really corny (like us) tape a googly eye on top for a playful “eye love you.” You get it. If they have the same silly sense of humor, so will they. 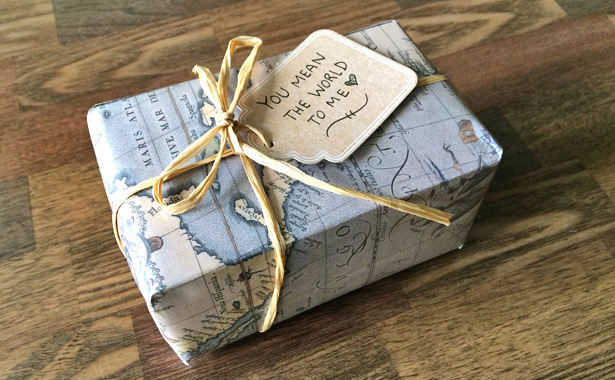 All you need is a printer and you can proclaim your love with gift wrap you designed yourself. Fill pages with classic love sonnets, a poem you wrote, the word “love” in seven languages, sweet nothings, pet names (cuddle bug, honey … ) or simply “I love you” over and over again in a font with romantic flourish. If your crush likes to play games — word games — make word search paper with an online puzzle-making tool. Crafty Steals has a great step by step. Nothing says Valentine’s Day like a gift decked with hearts. Use contrasting shades of paper and cut hearts out of the top sheet. Or use glitter paper — or even photos — beneath plain brown paper. 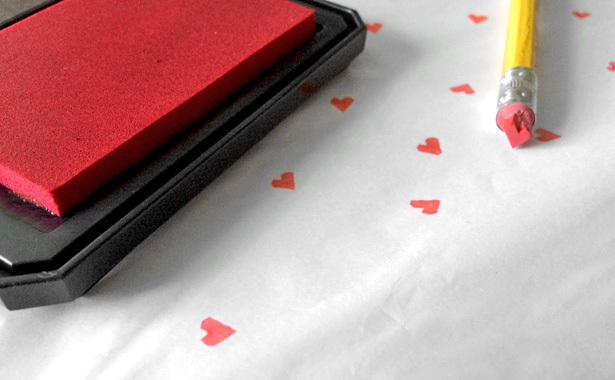 Even simpler, carve a heart out of a pencil eraser, dip in ink and stamp hearts on colored tissue paper. The House That Lars Built’s blog has instructions for both. Minieco’s blog puts a digital chic spin on heart patterns with their printables. Instead of a bow, crown your gift with an artful rose. Recycle newspaper, poems, sheet music or love sonnets for a vintage vibe. Go more mod with colored copy paper. We love The Elli Blog’s free templates. 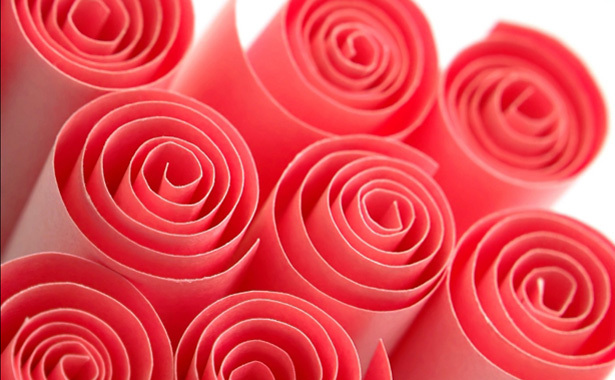 Add a dose of old-fashioned elegance with Creations by Kara’s super-simple rolled paper rose. Take them down memory lane with a surprise wrapped in the sheet music for your song (if you don’t have a song now’s your chance to call it). You could also cover it in love notes you kept or a photo booth reel where you mugged like goofy teens in love. 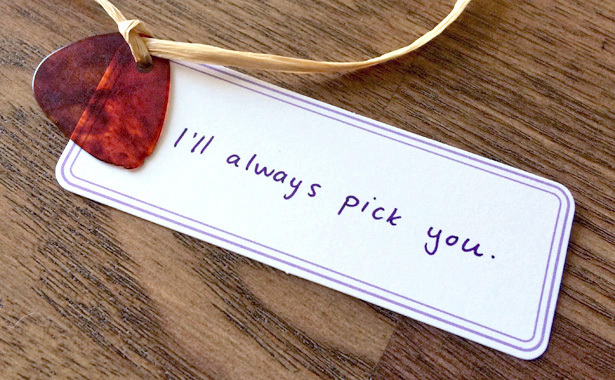 Save ticket stubs from movies, bands or plays you enjoyed together and upcycle them into gift tags. We’d love to see what you make, whether it’s one of these ideas or something else entirely your own. Share your finished gift photos with us on Twitter, Facebook, Pinterest or Instagram.